The Sinclair Hollow Trail is located in the North River Ranger District of the George Washington National Forest, near the Virginia/West Virginia line. (Map) This is not a trail that is easy to reach. 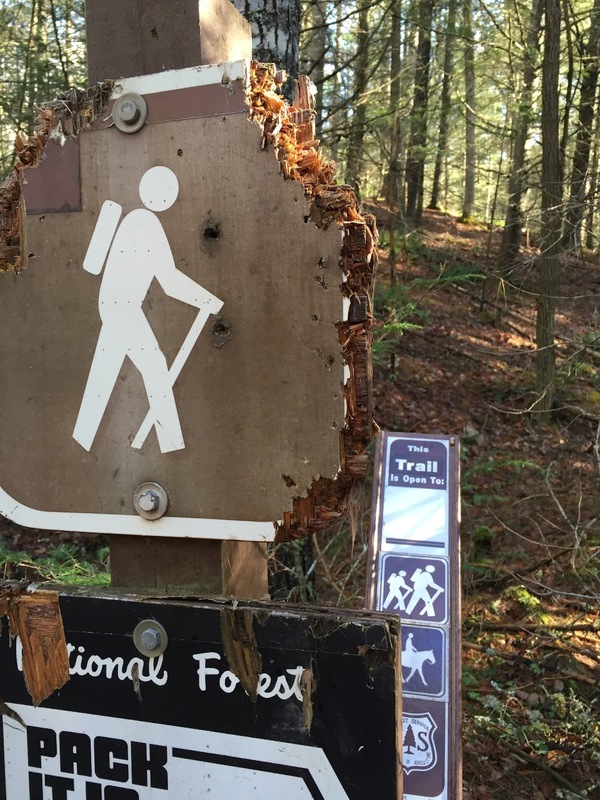 The trail climbs the western ridge of Shenandoah Mountain and accesses parts of the George Washington National Forest on the western edge of Ramsey's Draft Wilderness Area. I have tramped past the eastern end of this trail a couple of times, on the crest of Shenandoah Mountain at the boundary for Ramsey's Draft Wilderness. This point is a long round trip from any trailhead, which reflects the wonderful remoteness of this region. 4.3 trail miles from FS 95 to the north via the Shenandoah Mountain Trail. 4.8 miles from Camp Todd and FS 95 to the east via the Wild Oak Trail, the Hiner Springs Trail, the Ramsey's Draft Trail, and the Shenandoah Mountain Trail. 7.0 miles from the Confederate Breastworks on U.S. 250 to the south via the Shenandoah Mountain Trail. And, this is the easiest part of the Sinclair Hollow Trail to access! Lynn checks out apparent bear hair in the lower right portion of the chewed up hiker sign. Sinclair Hollow is one of the few trails that I can honestly state has a roadside trailhead that is even more remote than the other end of the trail, just inside the wilderness boundaries! 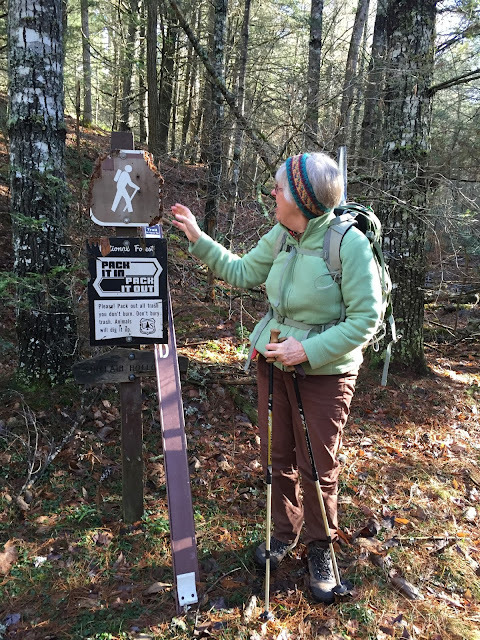 I have earlier stated my belief that the Rough Mountain Wilderness's Crane Trail's trailhead is the most remote trailhead in the George Washington National Forest. The Sinclair Hollow Trailhead is more difficult to reach. Can you see the hair hanging down from the sign at the 5:00 position? Although FS 95 was in great shape, the FS 64 portion involved some rough driving and a stream ford. I would not attempt this drive without a high clearance 4x4, and was glad that others could shuttle me to the trailhead! I would not even do it with my Subaru Outback unless this part of Virginia had been experiencing an extended dry period. FS 64 is gated near where we parked our vehicle, though the gate did not have a lock, so we continued past that point. And, although some guidebooks state that FS 64 links to the south with US 250 in the town of Head Waters, I do not believe this is true. So there are no shortcuts to this remote trailhead. Crossing Shaws Fork of the Cowpasture River near the beginning of our hike. Sinclair Hollow Trail starts out on level ground at about 2600 feet elevation, crossing Shaws Fork of the Cowpasture River soon after passing the sign for the trail on FR 64. Shaws Fork and its feeder stream in Sinclair Hollow are the northernmost streams in the James River system. The stream just to the north (Brushy Fork) flows north into West Virginia before becoming part of the South Fork, Potomac River and reaching the Chesapeake via Washington DC instead of Richmond. The trail climbs Shenandoah Mountain's west side, going 1.6 miles up Sinclair Hollow. The trail is fairly steep for half of the length as it ascends the mountain, so be prepared to work hard. Panorama from the Sinclair Hollow Trail, taken about half way up the mountain. Elevation change ranges from 2600 ft. to 3600 ft. The slope ranges from 5% to 25+%, but averages at about 15% for most of the mile when it is climbing the main slope of Shenandoah Mountain. There are a couple of areas where the trail makes a small detour because of downed trees. Other than at these spots, the trail is relatively well marked. The occasional plastic diamonds are usually found in areas where the trail is obvious. Returning back down the trail, it is a little tough to follow for the first 50 feet after leaving the Shenandoah Mountain Trail, but is evident once you start dropping off of the crest. Yellow plastic diamond signals the trail as it descends Shenandoah Mountain. Water is available from the creek in the hollow. There is also a small pond near the lower end of the trail, which appears to provide a nice, remote spot to camp. Sign where the Sinclair Hollow Trail ends at the Shenandoah Mountain Trail. You can see a Wilderness Boundary sign above the trail sign, though most of that sign is gone. next to the Sinclair Hollow Trail's terminus. The Sinclair Hollow Trail itself would be part of the proposed Shenandoah National Scenic Area (NSA). NSAs have fewer use restrictions than Federal Wilderness Areas, so mountain bikes and hunters' game carts would be permitted on this trail. (An example of a local NSA is the summit of Cole Mountain, on the Appalachian Trail near Amherst and Buena Vista.) 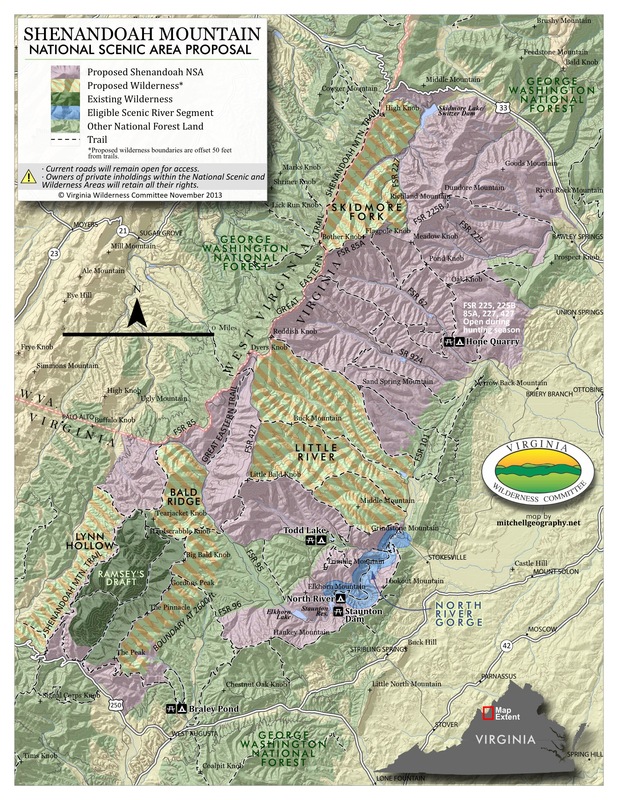 As a result of accommodations to various groups with sometimes disparate interests in the use of the National Forest, the Friends proposal has received endorsements from a large number of organizations (List). I recommend that you check out their website and review their proposals, and I strongly support their work.